What could you complete today or this week? Or what could you just let go of because it doesn’t really need to be done? Having things sitting unfinished takes up mental space and energy that you could use for much bigger and better things. This was my pile of books. I used the process from the book “The Life Changing Magic of Tidying Up” to let go of so many books. It was a great process. 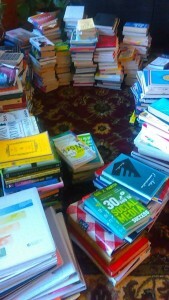 The beginning of this year I got rid of a bunch of books (Over 150. I read a lot.). When I did this, I realized some of my books had started to feel like a “To Do List” or “books I should read or do something with”. I found from talking with some of my clients, it’s the same for them. You? 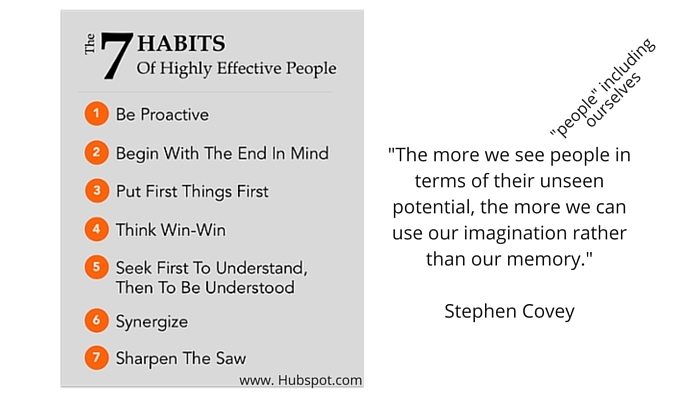 One of the books I got rid of was Steven Covey’s “7 Habits of Highly Effective People“. I know it’s a good book and I tried to read it many times, even bought the CDs, and just couldn’t get through it. I think it’s because it’s info I already know. But it’s one of the best success books out there and I felt like I should read it (also true with one of my clients). It felt great to just let that go. Then today I was working on something and needed info from the book… so I googled “summary of….” and Voila! I found the summary and learned a few things in the process. 1. The book is great, attached is the summary version (I still didn’t finish it). 2. If something is not right for you (or me), trust that. You know your self best. Let go of what doesn’t work and find something that’s right for you. 3. Letting-go-of or taking-on one incomplete a day or week is a powerful practice and can free up your energy and creativity to do the important things that you want to do. Having a list and checking them off as we complete them or let them go, can be very powerful. 4. And sometimes, there is a shorter, easier way!